Now all you fans of psychedelic shoegaze music take note! 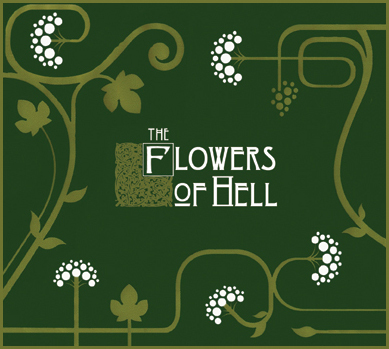 The Flowers of Hell are a London based collective of ten musicians and this album also features involvement of Tim Holmes from Death in Vegas and Sonic Boom (Spacemen 3/Spectrum/E.A.R). This is a great album in the vein of Spacemen 3 and Spiritualized, but also has a feel of its own. The album begins with a great horn track “The Sunrise Retreat” that sounds very nice and serene. “Opt Out” is a long track with a lot of stuff in it. It begins in a very tranquil way and gets very hypnotic after it grows a bit. It includes some guitar, synths, organ, strings, horns, bass and drums, and is a very pleasant, mostly peaceful Spacemen 3 styled number. The end speeds up into ecstatic heights. Great stuff! The next track “Sympathy for Vengeance” is another winner reminding me of The Dark Side. This is very beautiful, dreamy and psychedelic stuff, and there’s even a heavy space boogie part towards the end. “Foreign Lands” includes peaceful guitar, drone, strings and in the end some female narration. The quite minimal and sad “Compound Fractures” has piano, musical saw etc. “Through the F Hole” is an organ drone with some beautiful guitar, psychedelic delay and tremolo effects, violin and features Sonic Boom. The nice and a bit more positive “The Joy of Sleeping” also seems to have some vocals. This is great number in the style of Spacemen 3 and Spiritualized with drums, trumpet, violin, guitar etc. “A Moment in Time” begins with a melancholic guitar that is soon joined by the comp. The track gets a little heavier later on. The short and peaceful “Phase One Radiator” has just some echo guitar and bass. The album finishes with minimal, picturesque and vague “Telescopic Suite”. This is really enjoyable album if you’re into instrumental, druggy, dreamy, hypnotic and psychedelic shoegaze stuff that combines orchestral instruments with rock and has a bit of Velvet Underground feel. I like this a lot! The limited edition digipack CD is now available and the band is looking for somebody to release this great album on vinyl, as well.